If you guessed that Nectar Babe nectarine trees (Prunus persica nucipersica) are smaller than standard fruit trees, you are absolutely right. According to Nectar Babe nectarine information, these are natural dwarf trees, but grow full-size, luscious fruit. You can start growing Nectar Babe nectarines in containers or in the garden. 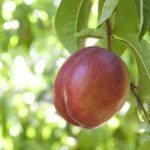 Read on for info on these unique trees plus tips on planting Nectar Babe nectarine trees. Nectarine Nectar Babes have smooth, golden-red fruit that grow on very small trees. 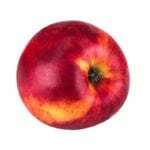 The fruit quality of nectarine Nectar Babes is excellent and the flesh has a sweet, rich, delicious flavor. Given that Nectar Babe nectarine trees are natural dwarfs, you may think that the fruit is small too. This is not the case. The succulent freestone nectarines are large and perfect for eating fresh off the tree or canning. 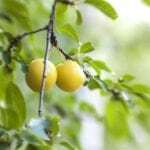 A dwarf tree is usually a grafted tree, where a standard fruit tree cultivar is grafted onto a short rootstock. But Nectar Babes are natural dwarf trees. Without grafting, the trees stay small, shorter than most gardeners. They top out at 5 to 6 feet (1.5-1.8 m.) tall, a perfect size for planting in containers, small gardens or anywhere with limited space. These trees are ornamental as well as extremely productive. The spring blossom display is extremely, filling the tree branches with lovely pale pink flowers. Growing Nectar Babe nectarines requires quite a bit of gardener effort but many believe that it’s worth it. If you love nectarines, planting one of these natural dwarfs in the backyard is a great way to get a fresh supply every year. You’ll get the annual harvest in early summer. Nectarine Nectar babes thrive in U.S. Department of Agriculture plant hardiness zones 5 through 9. That means very hot and very cold climates are not appropriate. To get started, you’ll need to select a full sun location for the tree. Whether you are planting in a container or in the earth, you’ll have the best luck growing Nectar Babe nectarines in fertile, well-drained soil. Irrigate regularly during the growing season and add fertilizer periodically. Although Nectar Babe nectarine information says you shouldn’t trim these small trees as much as standard trees, pruning is definitely required. Prune the trees annually during winter, and remove dead and diseased wood and foliage from the area to curb disease spread.